Thousands of the anadromous fish are making their way back to Highland Lake to spawn. 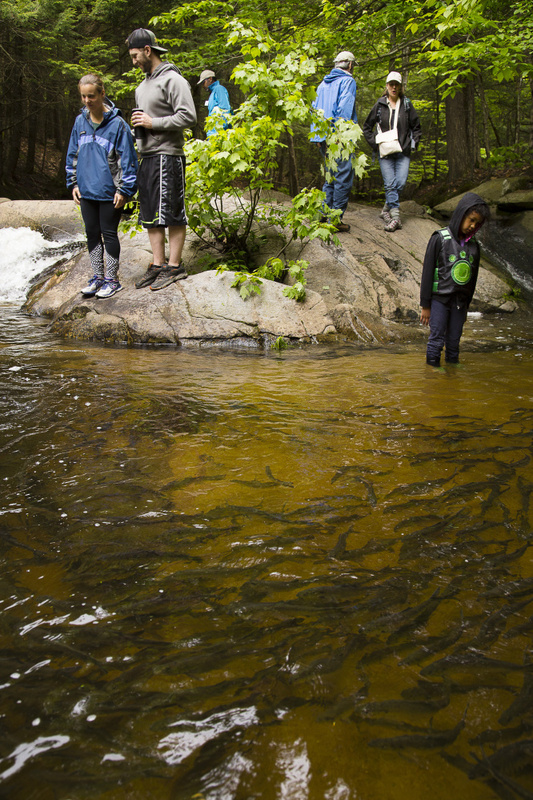 WESTBROOK — Ever since the alewives showed up earlier this week, Goldilocks Falls at the Presumpscot Regional Land Trust’s Mill Brook Preserve off Methodist Road has been a popular destination. The falls provide a front-row seat to the annual spring show of thousands of the anadromous fish making their way back from the Atlantic Ocean, up the Presumpscot River to Mill Brook and into to their spawning grounds in Highland Lake. When the alewives show up at the falls, hungry osprey, heron, sea gulls, crows, foxes, skunks and raccoons follow. Wildlife enthusiasts and fishermen are right behind them. On Saturday, five days after the alewives arrived, 37 people joined the land trust’s annual alewife walk to Goldilocks Falls led by Toby Jacobs, a land trust staffer, and Karen Wilson and Theo Williams, who are husband-and-wife researchers and teachers at the University of Southern Maine Environmental Science and Policy Department. Goldilocks Falls got its name from Westbrook resident Ralph Hatt, who grew up on family land along Mill Brook and donated 30 acres of his land to the land trust last year. “The water level has to be just right at the falls, not too high and not too low,” before the alewives will make the swim up the rushing waters, said Hatt. There is a lot that can go wrong, and if the fish can’t make it up, they will return to the sea to try again another day. That is why the USM Environmental Science and Policy Department encourages human intervention. The department organizes a volunteer fish-counting station at Highland Lake to monitor the numbers of returning fish. Volunteers, including Hatt, patrol the brook for beaver dams, which they are allowed to remove, thanks to a special permit from the state. Hatt removed five dams this year along the 5-mile section of brook he patrols. Dr. Theo Willis of the University of Southern Maine moves a large rock to clear the way for migrating alewives in Westbrook’s Mill Brook on Saturday. More than 30,000 alewives come through Mill Brook to spawn upstream in Highland Lake. In pre-Colonial times, Maine’s rivers and streams once roiled with alewives. But several centuries of dam development, pollution and overfishing have taken a toll and the population plummeted. Today there are a number of public and private efforts underway to restore their numbers along the East Coast. 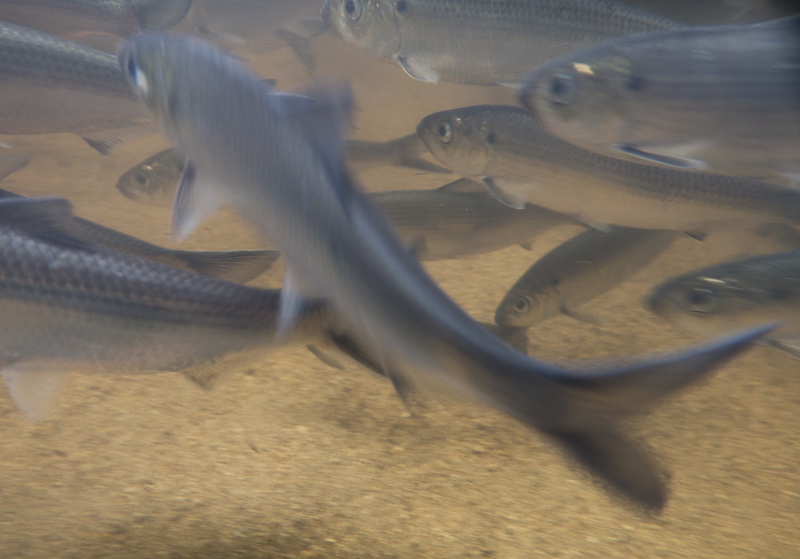 Alewives, close cousins of shad and blueback herring, return to the place where they were born to spawn. The returning fish will spend about two weeks in Highland Lake before returning to the George’s Bank, the Bay of Fundy and other locations. The juveniles will spend about five months in the lake and then move out to the Presumpscot River estuary, where they will spend a year or two before moving off-shore. Alewives can live to up to eight or nine years, if they manage to escape predation and fishermen’s nets. They can reach 14 inches and weigh a pound or more. The 37 walkers surrounded the pool at the bottom of the falls, taking photographs and studying the fish, which were swimming about in large schools. It appeared the water level was not to the alewives’ liking because they were not venturing up the falls. Several alewives make their way up Westbrook’s Mill Brook on their way to spawn in Highland Lake on Saturday. 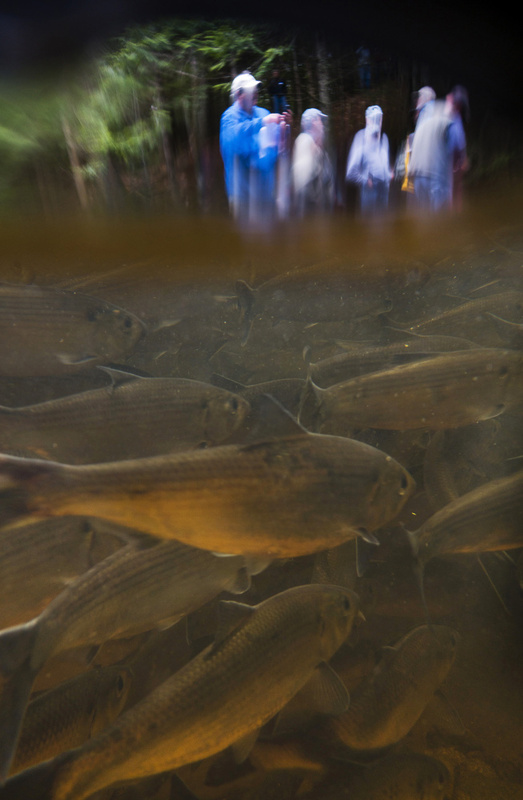 These fish are part of Casco Bay’s largest migrating fish run, which can be viewed via hiking trails in the Presumpscot Regional Land Trust’s Mill Brook Preserve. Christine Joyce of Limington was there with her son, daughter-in-law and her two grandchildren. She said she had such a good time on a hike with the land trust last year she wanted to try it again. Steve Roberts of Hollis, a retired Washington state biologist, was pondering the mechanics of equipping an alewife with a device to monitor its progress. “You can tag anything,” he said. The trail-heads to the 120-acre Mill Brook Preserve are on Allen Knight Road, next to 789 Methodist Road in Westbrook, next to 55 Perry Court and across from Willow Drive off Route 302.